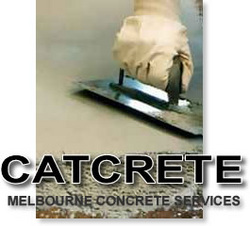 CatCrete are independent concrete contractors servicing Melbourne's eastern suburbs specialising in concrete paving for Driveways, Kerb & Channel, Garage Flooring, Patio and Outdoor Areas. We pride ourselves in quality concrete work, delivered on time with excellent customer service. We get the job done right the first time, every time, without cutting corners. CatCrete with over 10 years experience providing concreting contractor services and use only the best materials supplied by trusted and reliable sources. Call Adrian 0412 311 176 Now for an obligation free quote! Concrete Paving covering Melbourne's Eastern Suburbs.. Covering Melbourne's eastern suburbs and northern suburbs. Forest Hills out to Springvale Road..
Get an Estimate Quote now!